We have helped many dentists successfully market their dental implant services, including implant-supported bridges and dentures and same-day hybrid dentures.Through the years we have isolated the most successful and cost-efficient methods to market dental implants. With the advent of 3D imaging in dentistry, more dentists than ever have been able to offer their patients dental implants. This has also made dental implant marketing very competitive, especially on the Internet. Internet marketing for dental implants can be tough to succeed with due to the high cost-per-click of paid advertising and the high competition for top spots in the natural (organic) results. Some geographic areas are particularly tough to market in, such as metro areas with dense populations of dentists. What’s more, Internet marketing brings out the implant price wars! Many of our clients don’t want to offer cut-rate implants and so don’t always get the traffic that the dentists offering cheap implants get. While we can get decent results with Internet marketing, we recommend our custom magazine direct mail return on marketing implant services. 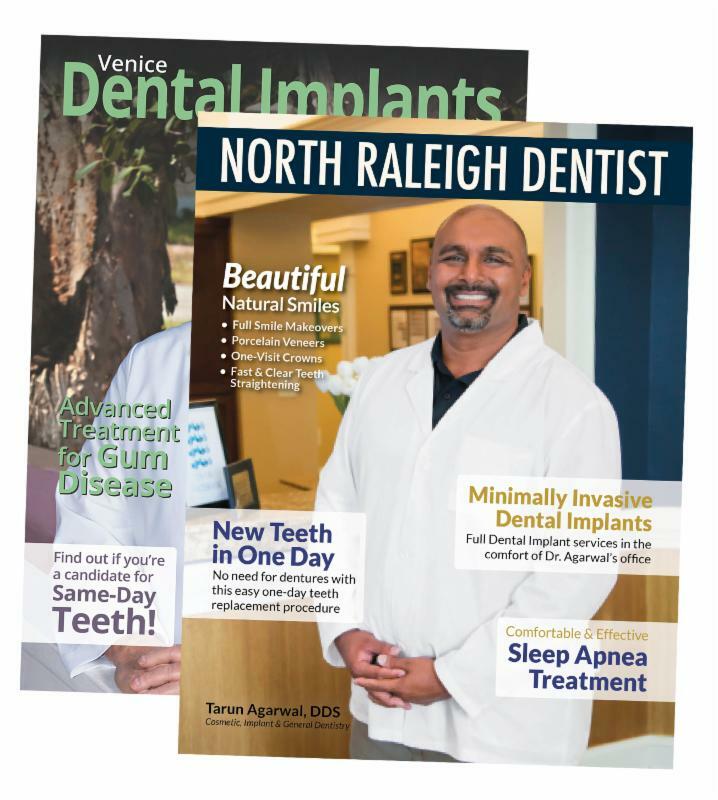 Our most successful program for implant marketing is our Custom Magazine Direct Mail Program. Our 12- or 16-page magazines are made exclusively for each individual practice and are designed to appeal to people needing more extensive dental work. These magazines are sent to target demographics. The magazines’ engaging format and similarity to commercial magazines makes them attractive, interesting and desirable to keep. Best of all, they are able to elicit high response for implant services, including hybrid dentures, new teeth in one day procedures and large full mouth reconstruction case. Call 855‑486‑2410 or contact us here for a complimentary marketing consultation to see how we can help you with your dental implant marketing. We’ll answer any questions you have and, as needed, analyze your current implant marketing.